Month two, Tigress’s can jam canning challenge, and the ingredient to grapple with is ‘carrots’. They aren’t in season in the UK, not as a freshly pulled from the ground seasonal veg at any rate, otherwise I would have found some of those trendy purple ones to work with, or a nice bunch with their greenery attached that would have made a lovely picture tied in a bundle with garden twine. 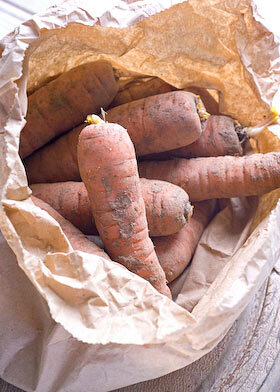 So a brown paper bagful of locally-grown and stored organic specimens is my starting point. There is one good thing about it, I’ve learnt a lot since ‘carrots’ was announced. I wanted to find a recipe suitable for canning that needs carrots instead of just includes them, so I trawled through my extensive collection of books on preserving. I felt sure I would unearth a war time gem, thinking carrots would have been used more as a sweetener in times when sugar was scarce, but nothing turned up. I didn’t want to simply bottle carrots for the sake of it, couldn’t find a suitable pickle recipe, was about to adapt a Madhur Jaffrey recipe for quince and lemon chutney (by adding carrots) then forgot and cooked my last quinces. I was tempted by my trusted and much loved ‘Let’s Preserve It’ by Beryl Wood, a little jewel of a paperback from 1970 which contains 579! recipes, including a carrot chutney, a jam, 2 marmalades as well as a recipe for spiced carrots. but eventually settled on combining carrots with rhubarb in a jam. British forced rhubarb is just starting to appear for sale. The season for forced rhubarb, grown in the ‘Yorkshire triangle’ begins January through to April, when field grown takes over. My head has been full of rhubarb all month as I am sorting out which varieties to plant on my allotment. Rhubarb alone is fantastic, so I just hoped that the inclusion of carrots in the recipe would be a wonderful addition rather than just meeting the canjam deadline. I’ve also added some chopped stem ginger and candied peel as I have some candied melon slices left over from baking at Christmas, so it has been a good opportunity to use some up. I recommend you use good quality candied peel for this, usually sold in chunky pieces from a deli or health food shop, rather than that ready chopped stuff in tubs surrounded by gloopy syrup you find in supermarkets. I did have to watch that the jam didn’t burn whilst I was boiling it to a set. As it cooked it turned to a beautiful deep orangy-red gelatinous consistency but it spat as it boiled. 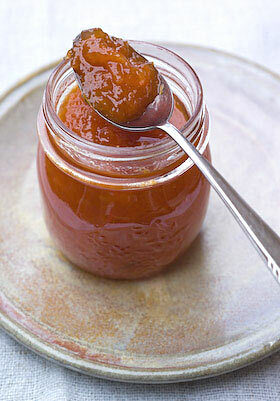 As both carrots and rhubarb are lacking in pectin, it is probably advisable to use jam sugar with pectin added or add extra pectin if you want a good set. I used half ordinary white sugar and half jam sugar, because I had some needed using up. What I have ended up with is quite a soft set but the taste is amazingly good. 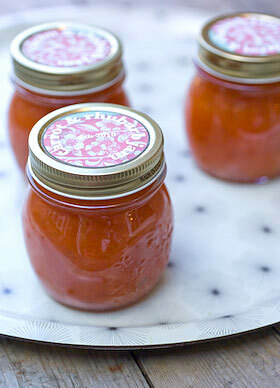 The recipe uses enough carrots to be ‘useful’ from the ‘using up a glut’ perspective and the jam isn’t overly sweet, so it makes perfect sense for canning. It would be ideal as a filling for jam tarts or Tigress’s thumbprint cookies or to fill a larger pastry case with the addition of an egg beaten into it then baked in the oven to set. A slice served with cream or mascarpone flavoured lightly with some ginger syrup from the stem ginger jar would work perfectly. All in all, it has been an unexpected success. 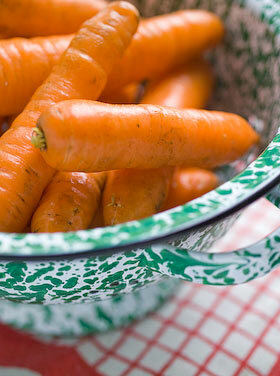 Finely grate the carrots and place in a pan with 500ml (3/4pt) of water. 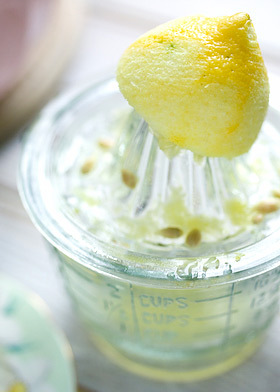 Finely grate the zest from the lemon, squeeze out the juice and place to one side. Chop the lemon halves, pith and all, into chunks and place them and any pips in a muslin bag tied closed with string or a knot and add them to the carrots. Bring to a simmer and cook with the lid on for 20 minutes, then remove from the heat. Chop the rhubarb into 1cm (1/2in) sized cube pieces. If the sticks are thick I slice them lengthways once or sometimes twice before chopping into equally sized small chunks. 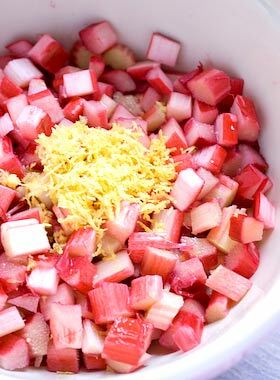 Place the rhubarb in a bowl, add the lemon zest and juice and pour the sugar over it. Cover and leave for an hour or two until the juice starts to run from the rhubarb. Tip the contents of the rhubarb bowl into a preserving pan and add the cooked carrots, cooking liquid and muslin bundle. Add the finely chopped stem ginger and candied peel cut into thin slivers. Heat slowly, stirring all the time until the sugar is completely dissolved, then turn up the heat bring to a rolling boil and cook until setting point is reached (this took me around 25 minutes). (Test for a set on a cold plate or use a jam thermometer.) Discard the muslin bag. Pour into hot sterilised jars, leaving 1 – 2cm (1/2 – 3/4in) headspace, screw on the lids to fingertip tight and process for 10 minutes in a hot water bath. For more info about how to hot water process your preserves, refer to the guide here. Leave your jars until cold and don’t forget to label and date them.